Tom Lackey, 93 from Shirley West Midlands,, will attempt his 31st wing walk in March 2014 from Morocco to the rock of Gibraltar in aid of Cancer Research. Tom Lackey is an inspirational individual who has raised over £1 million for several charities and currently holds nine Guinness world records relating to aerobatics. When Tom is not flying he remains mobile using a TGA ‘Superlight’ which is a 3-wheel mobility scooter that can be easily dismantled for transportation in a car. This 4mph model gives Tom freedom at home to visit the shops and friends as his mobility is restricted due to his age and following a stroke in 2004. He was featured on BBC television during August 2013 when he successfully completed his most daring wing walk to date, across the Irish Sea from Castle Kennedy in Scotland to the City of Derry airport in Ireland. He flew for 81 minutes strapped to a vintage Boeing Stearman biplane and intends to complete a similar feat in March 2014 across the Mediterranean Straits of Gibraltar. Tom began training to be a pilot at the mere age of 80, one week after his wife Isabel passed away. During Isabel’s successful career in the RAF, she had joked that he would never be able to fly a plane which inspired him later in life to ‘make her proud’ with his aerobatic stunts. Tom worked until he was 79 as the owner of a successful building company that had been previously established by his father. It traded for over 100 years until Tom retired in 2000 and he began pursuit of a pilot’s license. Tom completed the majority of his CAA (Civil Aviation Authority) pilot training however due to his age, he was not allowed to fly single-handedly, especially when performing dramatic aerial manoeuvres. 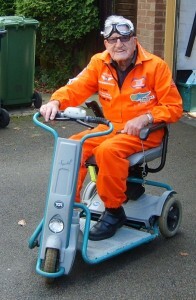 As Tom is an independent person thanks to his TGA mobility scooter, he prefers not to need help so wing walking appealed as a solo, daredevil sport. In fourteen years, Tom has achieved nine world records, wing walked 30 times and experienced every aerobatic stunt possible either stood on the wing or at the pilot’s controls. Be the first to comment on "93-year-old, nine-time World Recorder holder to win walk across Mediterranean"